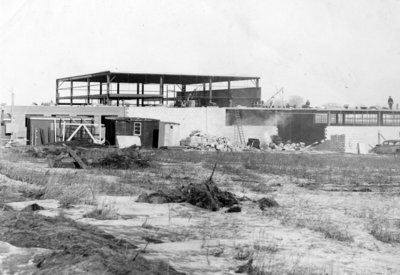 A black and white photograph of the DuPont Plant in Whitby under construction. The DuPont Plant in Whitby, which makes polyethylene film for packaging, was built in 1958/59 and received several additions. Located at 201 South Blair Street. DuPont Plant Whitby, January 1959, The Oshawa Times. Whitby Archives 15-017-002.